KItoguard is a natural antimicrobial, antibacterial, and antifungal agent for use in agriculture & horticulture. 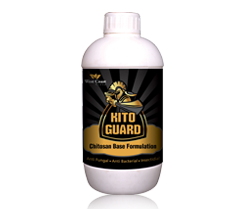 Kitoguard is based on revolutionary concept of Chitosan a marine bio product and ayurvedic product. It is known to be biocompatible, biodegradable and nontoxic. Kitoguard improves seed germination, root development and disease resistance.Kitoguard also elicits responses which include stem elongation, stimulation of ethylene production and antagonizing auxine, but the they are best known for elicitation of various defensive action. Kitoguard is the compilation of what each product can do to protect and stimulate growth of your plants. Kitoguard molecule is reported to be active against viruses, bacteria and other pests. Kitoguard is provides a variety of defense responses in host plants in response to microbial infections, including the accumulation of phytoalexins, pathogenrelated (PR) proteins and protein inhibitors, lignin synthesis, and callose formation. Kitoguard gives good control over Virus like Leaf Curl,Yellow mosaic etc. Kitoguard fulfills secondary nutrient requirement of plants. Product has only organic ingredients and hence no chemical residue is left. Hence it can be sprayed in Export crops during last stages as well. Kitoguard provides protection against Bacterial,Fungal diseases and insect infestation. Kitoguard must not be mixed with Alkaline Media products while spraying. Kitoguard is compatible with acidic base / neutral / liquid fertilizers, insecticides, fungicides. For preventive purpose mix and Spray 10ml Kitoguard in 15 liter water and repeat the spray in 15 days interval. For Curative purpose mix and spray 1-1.5 ml/liter of water and spray 2 times within an interval of 10 days. For Drenching purposes mix 2ml of Kitoguard per liter of water. Grapes, Orange, Mango, Apple, Pineapple, Sugarcane, Paddy, Beans, Muskmelon, Watermelon, Pomogranate, Capsicum, Tomato, Cardomom, Black Pepper, Floriculture, Rose, Gerbera.